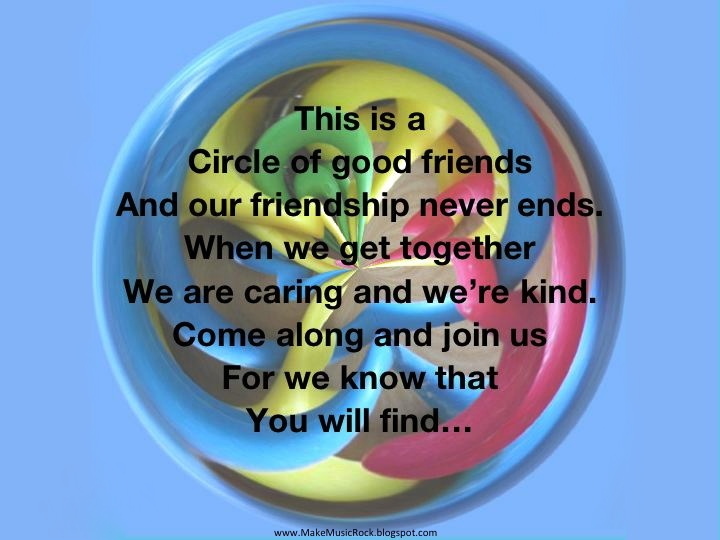 This is Circle of Friends Week at our school. This annual event gives us the opportunity to focus on ways to be a good friend to everyone, including children with special needs. 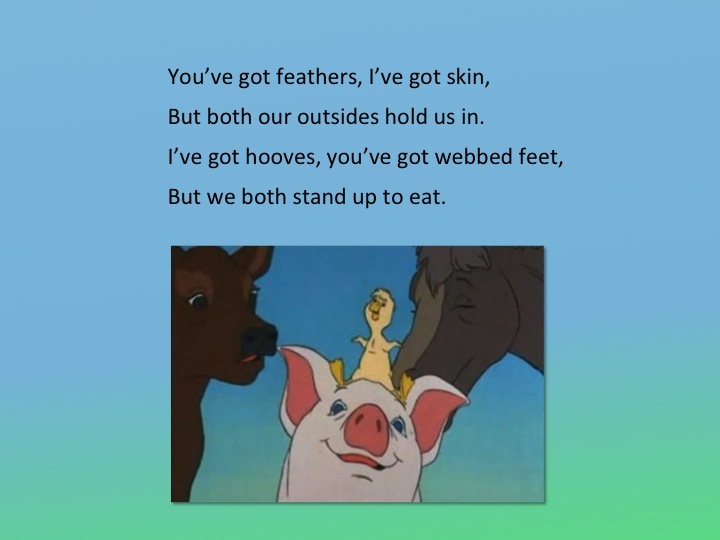 We have two songs that we use during this week to remind students to be accepting of everyone. 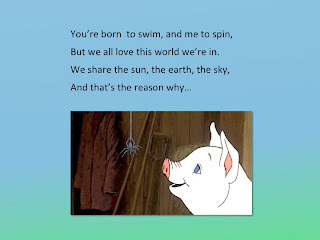 "We've Got Lots in Common" from Charlotte's Web has a singable melody, a catchy refrain, and the perfect message for our Circle of Friends Week. 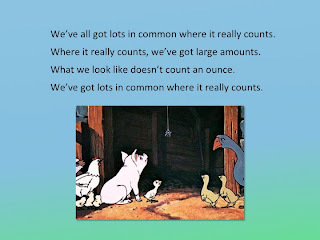 It is included in our 3rd grade textbook (Making Music, Silver Burdett 2005, p. 366), which makes it simple for us to use. After we learn the song, we sometimes add some finger puppets to dance and join in our singing. One more song we use is a version of "The Song that Never Ends." We reworked the lyrics to fit our Circle of Friends Week, but the message is one that is appropriate any day of the year. Phrase 4: "Come along and join us": 2 steps toward center of circle, stop & raise joined hands on the word "join," then "know that you will find" lower hands & take baby steps back to the large circle. We move quickly on our toes, as if playing a drumroll on the floor. Repeat as many times as you wish, and then end the song, "This is a circle of good friends, and our song is at an end." Then play V-I and let the students strike a pose to finish. We clap then put one foot out and one hand high and one hand low. We've used this song with K-3, and they have all enjoyed it. They ask to do it again and again and are always disappointed when it does finally end! 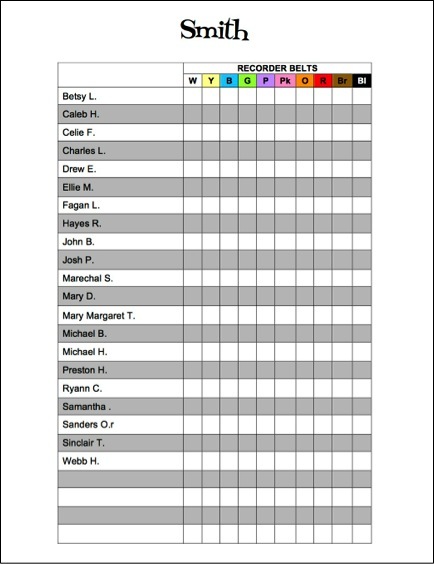 Celebrate Writing is a huge annual event at our school every February. Authors, artists, and musicians come and make presentations for our students. We spend a lot of time preparing for their arrival. 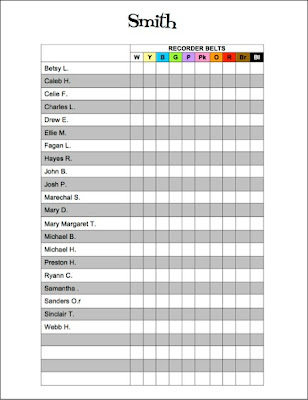 Each grade level is assigned to a presenter, and every student creates artwork that is displayed in the hallways to welcome the guests. Students also have the opportunity to read books by the visiting authors and often complete creative writing assignments that are based on the author's work or style. Our music department loves to help prepare the students for Celebrate Writing. In addition to listening to music by upcoming guest performers, we often find authors' books that lend themselves to creating melodies and Orff arrangements to accompany them. We have even had classes perform these songs for guests. This year, one of our guests is going to be Bob Barner, who is the author/illustrator of Dem Bones. 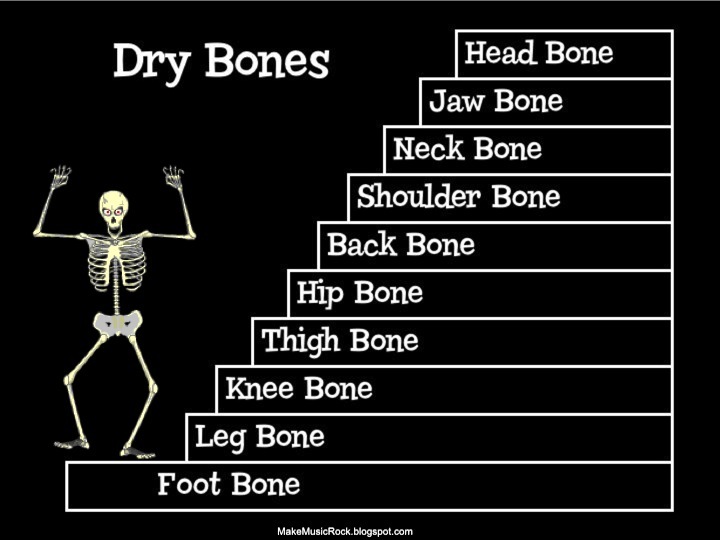 The book has wonderful illustrations, and the text is based on the African American song, "Dry Bones," with additional bone facts. Our text book series (Making Music, Silver Burdett, 2005) includes "Dry Bones" in the 4th grade book. The CD track is very appealing, so even the youngest students have enjoyed the song. Rather that focusing on trying to teach the entire song to young students, I chose to use the spiritual as a listening/movement activity. We danced around like skeletons during the A & C sections, and touched each bone and moved up our bodies as the melody moved up the chromatic scale in the B section. Most of the students actually joined in singing during the B section. 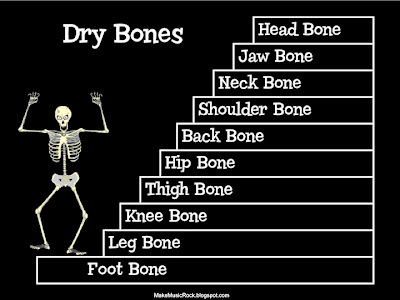 If you would like the actual PowerPoint file with the dancing skeleton, click on the link below. This is a follow-up to my earlier post, Recorders Rock! I thought I would add a couple more quick ideas that you might find useful. We use Yamaha recorders that are available in three colors. The students love the bright colors, and they have a nice tone quality. However, the plastic recorder cases are not very durable. Some students replace their torn cases with creative things ranging from socks to fabric or hand-knit cases. After I warned my fourth graders this year about the need to be careful with the cases to help them last as long as possible, a few students decided to take a proactive role. I have seen creative cases this year, and some look more difficult than others to make. 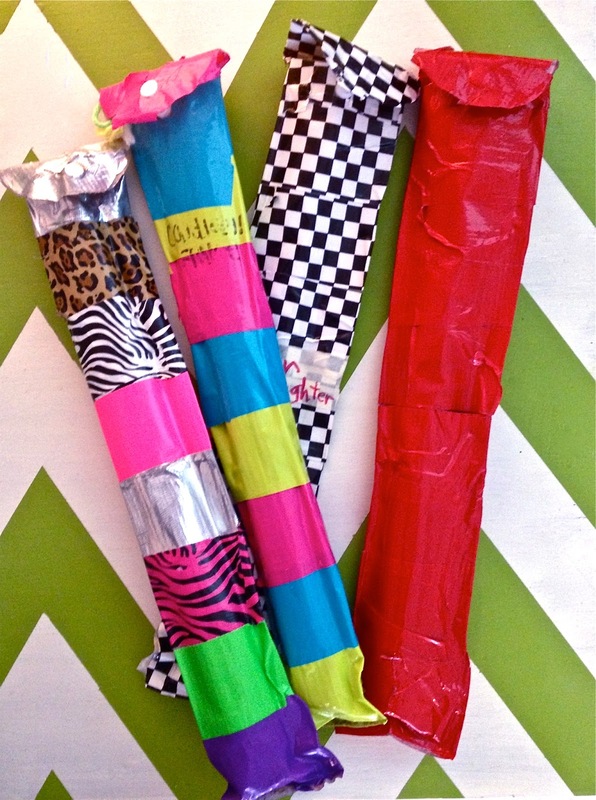 I spotted these duct tape reinforced cases in class this week, and thought they were an ingenious way to make the cases cute and durable. 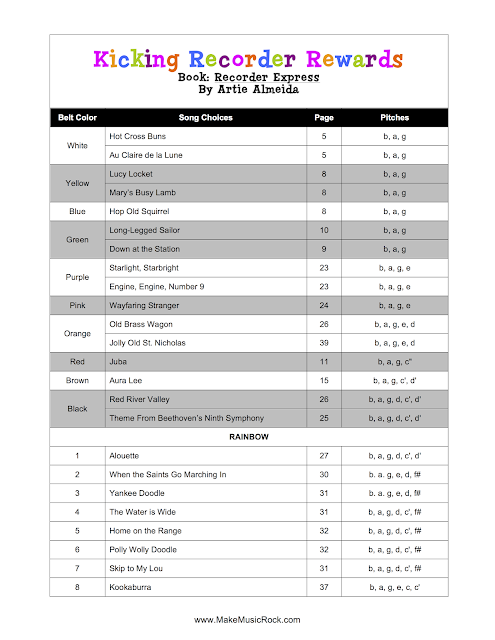 We use Artie Almeida's Recorder Express as the main source in our recorder curriculum, and belts (colored yarn) are awarded as students achieve new levels with recorders. We enhance the curriculum with music from Don Muro's Give Me Five, and Easy 8, as well as recorder songs found in Music K-8 issues. 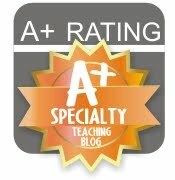 Check out B A Superhero (by M.C. Handel/arr. by Paul Jennings, Music K-8, Vol. 16, No. 1). This song is always a favorite with our beginning recorder players. I created a chart to keep up with recorder belt levels. You can download the Word document using the link below.